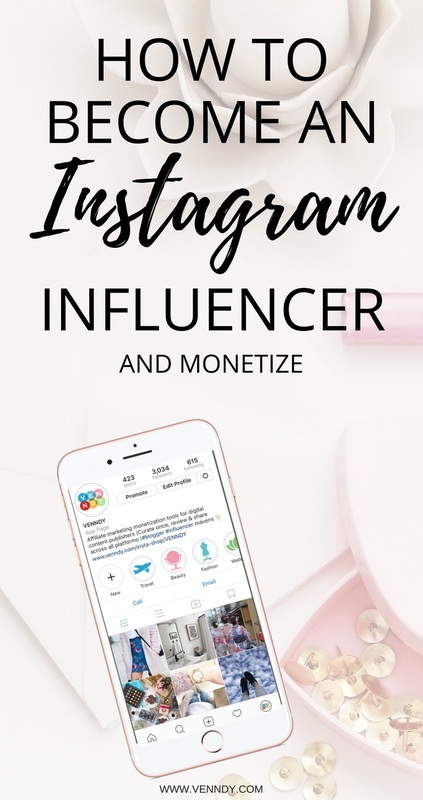 Even if you are still struggling to grow your followings, Instagram can be an important channel for driving traffic to your site as well as giving you a solid ROI for your time – no matter what your business. If you want to become an influencer using Instagram, keep on reading. 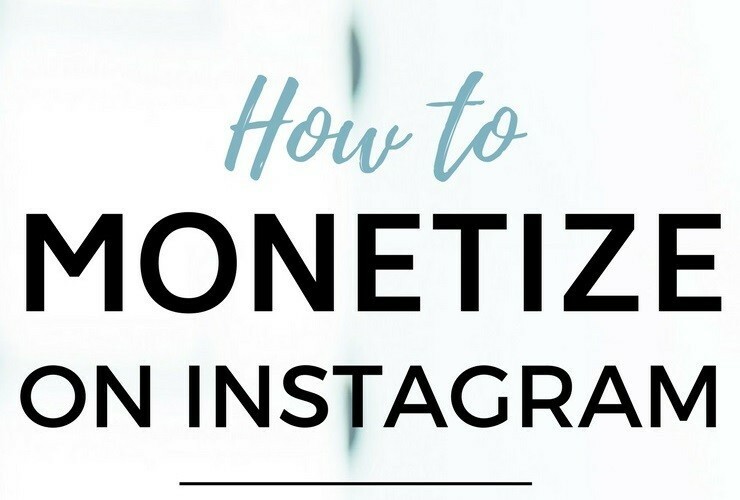 Using the tools and practices we share here, you can change the way you use Instagram, and regardless of whether you have a website or a blog, you can still monetize your creative content and social reach. This post is explaining how you can use VENNDY on your Instagram bio link. 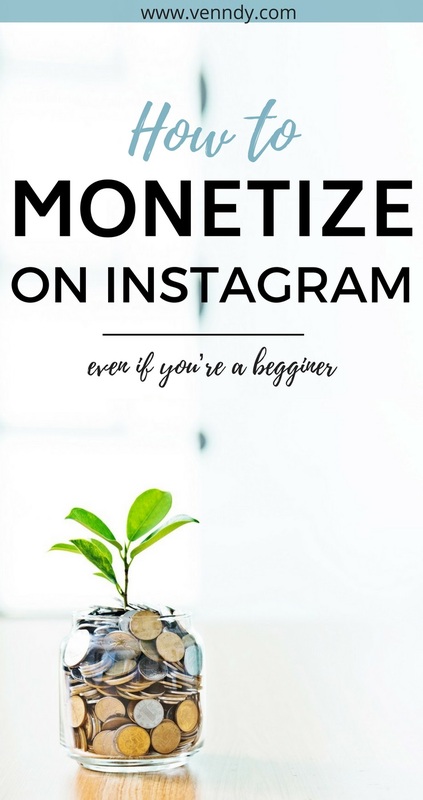 However, if you want to learn more why you should be on Instagram, regardless of your niche, and some of the trends and tools that brands use to keep up with the curve, you may want to start with THIS blog post. You too can use a shoppable gallery, and make the most of your one link in the bio. To help you get the best of your Instagram reach, HERE or at the end of this post you can find our Best Practices Guides for Beginners and for Pros. 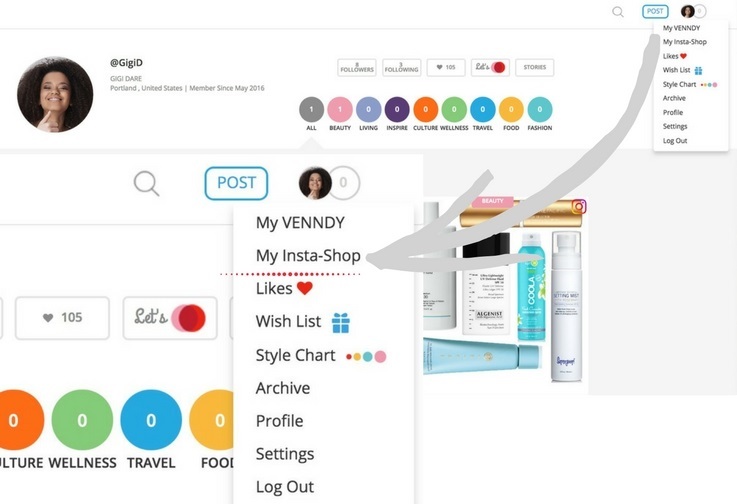 Using the VENNDY platform you can turn any of your Instagram posts into a collection of clickable, shoppable links. You can integrate your affiliate links into each of these links and monetize your content. If you are new to affiliate marketing, make sure to check out our affiliate marketing guides: The Basics (the terminology, how affiliate marketing works and some stats to help you understand the ecosystem), The Complete Beginners Guide, and The Best Affiliate Networks to join as a beginner. VENNDY’s tools help you create collections of your experiences. An experience can be a new outfit, a vacation, a dinner you hosted or an afternoon with friends. Every experience is a story on VENNDY and includes your Instagram image and a collection of items, places and services that made your experience memorable. A shoppable destination for your YouTube channel or other social media. To create a mirror image of your Instagram feed, follow these 5 easy steps to use VENNDY's tools and increase your earnings by leveraging your Instagram reach. Step One – Create a Story collection for every Instagram post you want published to your Instagram shop. Once you have a collection of items (clothes, accessories, places, hotels, books, etc. ), turn the collection into a VENNDY story. 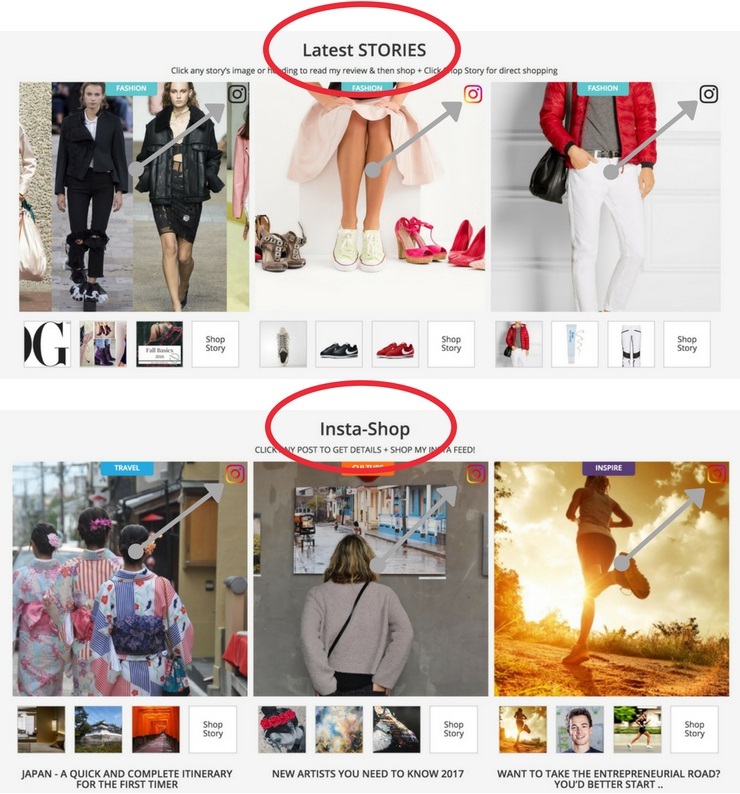 Upload the same image you uploaded to Instagram as the Story’s cover and gather into this story all the related items (when applicable, the items will already include the affiliate link you inserted). Make sure to create the VENNDY collections in the same chronological order as your Instagram feed. Learn how to curate items to VENNDY, with or without affiliate links, here and how to integrate them to stories here. Step Four – Link your Instagram shop to your Instagram bio. Provide the URL for your "Shop Page" in your Instagram bio. This drives all social traffic to your blog or website. Step Five – Teach your followers how to shop your Instagram. Include "Link in bio to shop my look” or "Link in bio to save and shop the items on this post" in the caption of each post. Use Instagram Stories to tell followers about your Instagram shop. If you have the Swipe Up feature, link it to your Instagram shop. Make sure to check out our other best practices posts to improve your performance on Instagram and your blog. 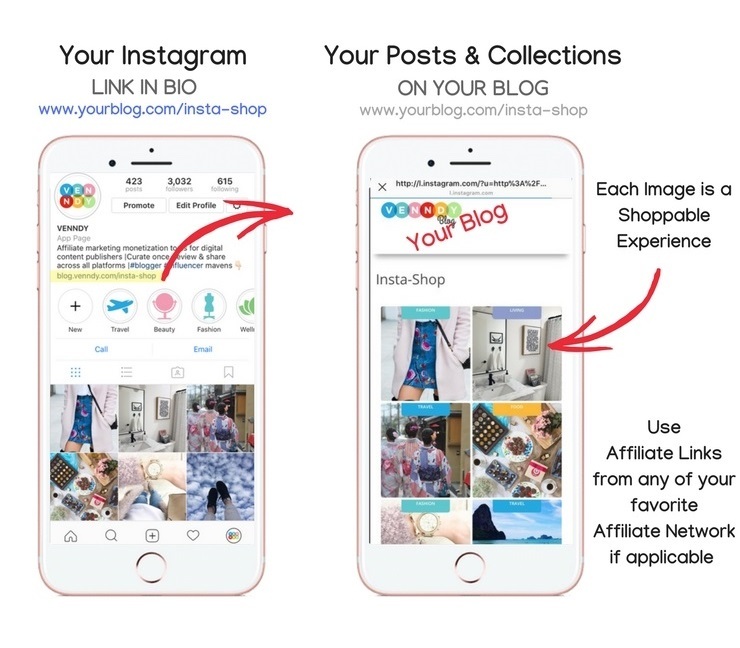 If you don’t have a blog, you can still create a shop destination for all your recommendations in order to monetize your Instagram. VENNDY helps you turn your passion and experience into helpful reviews and gather all your affiliate links into one place. You can help your followers shop by putting a link in your Instagram bio that directs them to your VENNDY Insta-Shop. Credit for the images: Denim Skirt, Bathroom, Chocolates, Blush Outfit. Learn how to curate items to VENNDY here and how to integrate them to stories here. Direct social traffic back to your site. You can add your blog post or a link to your YouTube video as the first item within the Story. This way all your content is organized and linked to one another. Make images you post to your social media accounts shoppable, including Instagram, Twitter and Facebook, by redirecting your followers back to your blog or website. Remove barriers (such as sign-ups) that prevent your followers from shopping your posts. Monetize your time, creativity and work. Ready to go? You can sign up to VENNDY here! Note that not all stories on your VENNDY have to be Instagram related. You can create stories on VENNDY to match your "Shop the Story” blog posts or Pinterest uploads. All the Stories you create will show on your Latest Stories page. Only the Stories with colored Instagram icons will show on your Insta-Shop; they will mirror your Instagram feed as long as they are uploaded in the same order as on Instagram. Sign up to VENNDY, and download the VENNDY LinkCollector Chrome extension. Use of the extension is currently by invite, so, once you've signed up, please send us an email with a link to your blog or social media account and we will send you a link to download the extension. We welcome beginners too. As long as you are an affiliate of any program, VENNDY will be a good fit for you. Email: info at venndy dot com. Upload your recommended products and places, add your affiliate links and share them on your favorite digital platforms. This post is all about Instagram, but you can also share on Pinterest, YouTube, and others. You can SIGN UP to VENNDY here and click GET STARTED. To learn more about how to use VENNDY to create collections and monetize, click HERE and HERE. Create a clear bio with the information that will help you achieve your goals and introduce yourself to others who may want to connect. Add your interests, location, what you are offering, and how you wish to collaborate (if relevant). Use VENNDY’S Story Collection to break experiences and outfits into small unites; this allows for a clean linking strategy and communicates your value prop. While the above is important, engagement is the key component for monetization, namely, converting followers into buyers. Continue reading below. Share your personal experience – Tell them about items according to your own experience, your initial expectations, add the pros and cons, and direct them to your site for further information. Instagram is a great way to prove your recommendation, whether it's a new outfit or a restaurant you visited. Sharing your own experience with the product you’re promoting is a good way of building trust and increasing conversions. You can use VENNDY to help you create this kind of engagement and ongoing interaction with your audience by letting them love a specific product, save it for later, and comment or ask questions. 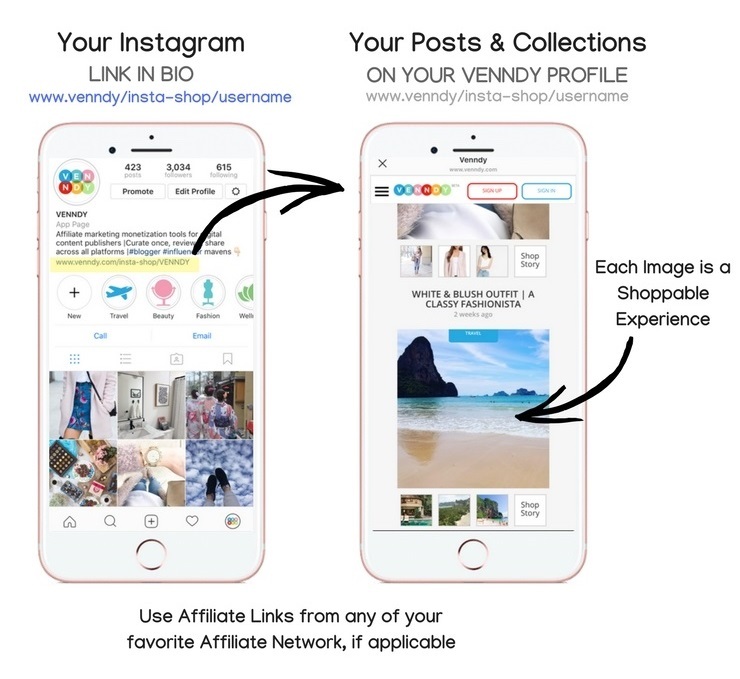 With VENNDY you can share a certain item on all your channels (blog, Instagram, Pinterest, Facebook, etc.). This way you increase trust, as the item doesn't seem randomly picked but rather an item which has become part of your life’s story and experience. About VENNDY: We believe that influencers should be compensated for their creative content when helping others make better, easier, and more personalized choices. In a hyper connected world truth is the best marketing strategy for building trust. Trust lead to strong relationships, which increase engagements, which, in turn, improve conversion and help you monetize your content. And of the many monetization methods used by digital publishers, affiliate marketing is the one that most encourages dependable relationships. It is around this concept that we built VENNDY with tools - to help you easily share your valuable experiences with your followers and help them easily access and save all your recommendations. 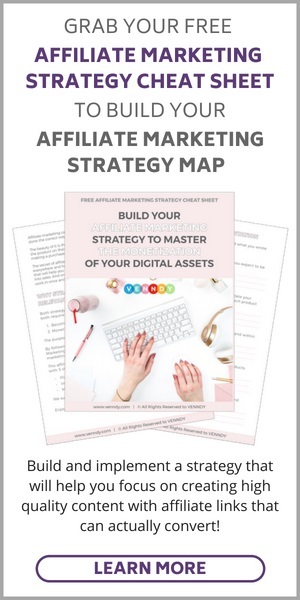 Building these connections online takes time and effort, but once established, you can enjoy monetizing your creative content as you become a trusted maven, or expert, in your field. 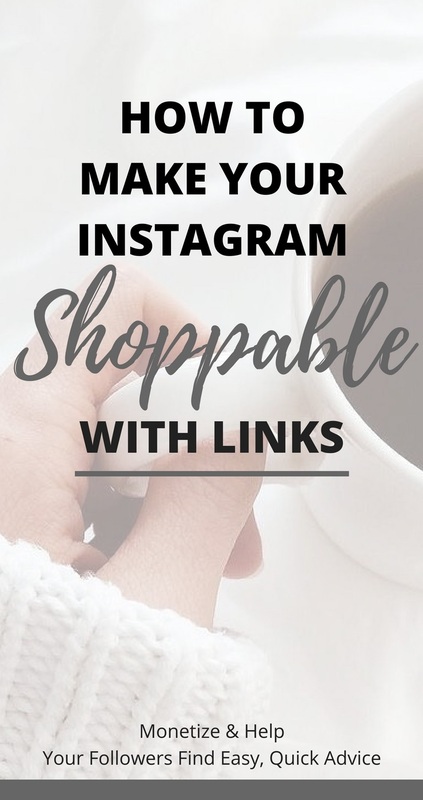 By turning your Instagram into clickable links, you not only introduce yourself better, but you also provide greater value to your followers by improving the way they can discover new businesses and products online.